Oh so you are interested in training young horses? I bet you just can’t resist the sweet fuzzy mane and long wobbly legs of a newborn foal, or the frisky antics of the 2 and 3 year old’s! 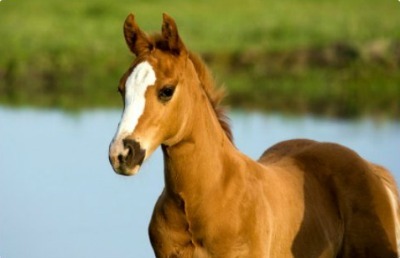 It is so easy to fall in love with young horses! But beyond the cuteness of a young horse there is much they need to learn to live a safe and fulfilling life in the world of people. A solid foundation can greatly reduce equine behavior problems down the road. Young horse training requires a high level of horsemanship. There is much YOU will need to know and learn to be successful in young horse training. Imagine you just brought home a new puppy to live in your home. They are cute and cuddly and oh-so-sweet! They are fluffy, fun to play with and a puppy nip doesn’t hurt that bad. What if the puppy goes potty in the house, and he runs off out the front door and won’t come back when you call him! It is cute and somewhat funny when the puppy is little but you wouldn’t be laughing if it was a full grown St. Bernard doing his business on your carpet. The bite from a full sized dog can cause serious injury. 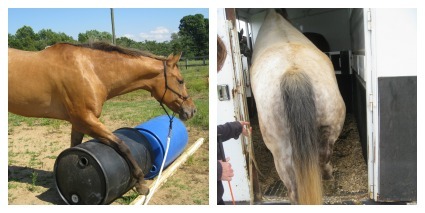 What does this have to do with training young horses? A horse that is not full-sized can put you in the hospital or kill you! This information is not to scare you but when training young horses you must always remember and respect what a scared horse is capable of. When horses get scared they FEAR for their LIFE. They aren't just being "difficult." They think the situation will kill them even if you know it won't. We are predators and often want to treat a horse horse like we would a puppy but this simply doesn't work and often backfires. Ground training young horses will build a language of communication that will transfer over to when you start riding him. Make sure he is completely OK with the saddle, stirrups etc flapping around at the walk, trot, and canter while you are on the ground. Better to find out that he is bothered by something BEFORE you are up on his back! It is much safer for you to build his confidence and keep yours by having a strong ground training program. Can you halter the horse easily and lead him at a walk, trot, and back up? Is he respectful of your space and does he stay with you? Can you flap the saddle pad around and rub it all over his body without him becoming fearful? Can you saddle him without him needing to be in cross-ties, or tied at all? Does he willingly accept the cinch or girth? Make sure it IS tight enough so the saddle doesn't roll. Then move him around a bit and tighten it some more. Is the horse OK with ropes near his face, neck and legs? These are just a few ideas to get you started. When you are training young horses for farrier he needs to be able to pick up his feet, let you hold them between your legs, and tap on his feet with a hoof pick to simulate shoeing. For the vet he needs to be OK with you handling everywhere on his body including under the tail, in the ears etc. wearing the saddle, saddle pad and bridle. Use a rope hackamore when you start riding. You CAN still teach him to carry a regular bridle with a bit but don't use it until he goes well in the hackamore. The standard training bits for young horses are a variety of snaffle bits such as eggbutt, d-ring, and full cheek varieties. My favorite is the french link or 3 jointed snaffle bit. It does not collapse like a regular snaffle and pinch the tongue and/or lips. Make wearing the tack part of the horse's routine so he becomes confident with each piece of equipment. The round corral or a small fenced area is the best place to be for the first ride when training young horses. Then get him confident with you putting a foot in the stirrup and lifting yourself repeatedly up and down on both sides. Approach and retreat is very important when training the young horse. Do each step in order and don't move on until he is completely OK, even BORED with what you are doing. This may take several sessions. 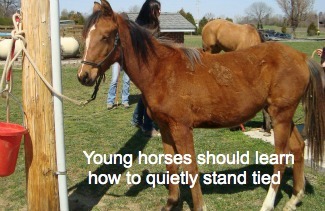 When training young horses the most important advice and training tip is to go at the horse's pace. After enough sessions that he is confident with you up there as a passenger, you can start to direct him. Take it slow and try not to make him feel wrong if he makes a mistake. Be gentle but as firm as it takes to get the desired response. Remember to quit when he gives just one positive reaction and then build on that. That way he will try harder for you next time. Enjoy your experience training young horses and remember to take things as slow as the horse needs you to! It is your job to get him ready for all the experiences he is bound to have in his life. You are the key to his success in the human world by what you teach him about people and the things they do. He is the ultimate judge of when he is ready to accept a rider but you must be in tune enough with him to know when that is! 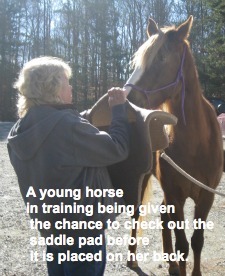 Leave training young horses to find tons helpful articles about training and horse back riding.